Who Wrote the Ricin Letters? I'll catch hell for this, no doubt... but from the moment I read one of the ricin letters I've been convinced that they was sent by a gay person. A white male, per Charles, but most likely a gay one. First, look at what's not in the letter: no references to a higher power, nothing about divine judgment, no railing against sin, no "God Hates Fags," no choice quotes from Leviticus, Romans, Corinthians, etc. That would explain, I think, the letters' author targeting the bar crowd—he's mad at the folks who he believes are out there having a good time, drinking up, hooking up. Guys who are making a success at what he's failed at. It was probably at the bars where he met the guys who broke his heart, the guys who fucked him over, the guys introduced him to meth, etc. The letter was also written by someone who, if the threat is genuine (which I don't believe it is), can presumably move undetected through all 11 bars mentioned, someone who wouldn't look out of place at the Cuff, Purr, the Eagle, etc. And the delight he takes in imagining the pain of his victims reminds me of the way cops describe the difference between someone murdering a stranger and someone murdering a lover: the degree of viciousness when the victim is a lover or an ex is usually much, much greater. Murder isn't the point; punishment for perceived wrongs and injustices is. Kinks in my theory: the Wild Rose got the letter too, and gay men—bitter or otherwise—don't spend a lot of time at the Rose. So maybe the author of the letter is just a generic hater, not a gay hater; perhaps he's a not-particularly-religious resident of Capitol Hill who just hates homos. Or maybe he put the Rose on his list because he didn't want to be accused of being sexist. 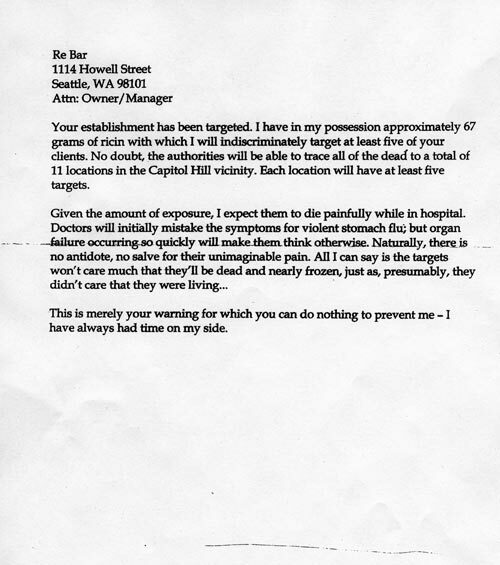 UPDATE: Here's some pretty solid evidence that the author of the ricin letters is gay.